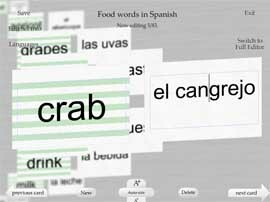 Flash My Brain - Make and study Spanish flash cards with ease. 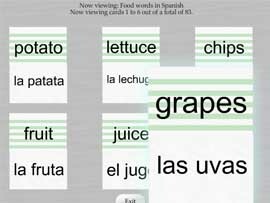 Make and study Spanish flash cards with ease. or choose from the 1000s in the library. 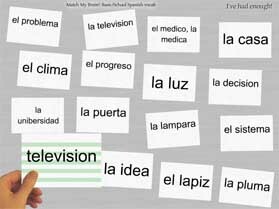 In Flash My Brain making Spanish flash cards is simple. Whatever cards you make can be shared and printed -- they look great on computer screens and on cardstock alike. Flash My Brain creates beautiful Spanish text flash cards, but it doesn't stop there. Upload mp3s of pronunciations to easily create talking flash cards. Flash My Brain helps you study these flash cards in the optimized learning mode and in diverting games. The Flash My Brain community awaits you. Buy Flash My Brain today for $29.95 and you'll be studying Spanish the Flash My Brain way in no time! Flash My Brain even has games to help keep you engaged in studying your flash cards.